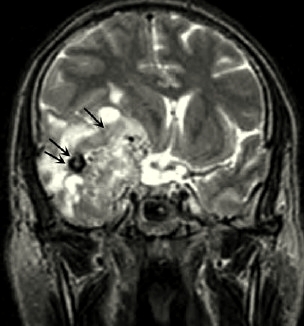 FIGURE 12.1 Malignant astrocytoma (glioblastoma). Coronal proton density-weighted MR scan through the temporal lobes demonstrates a heterogeneous right temporal lobe mass (arrows) compressing the third and lateral ventricles. The area of hypointense signal (double arrows) indicates either hemorrhage or calcification. Heterogeneous MR signal intensity is typical of glioblastoma. FIGURE 12.2 Model for the pathogenesis of human astrocytoma. Glioblastoma multiforme (GBM) typically presents without evidence of a precursor lesion, referred to as de novo GBM, frequently associated with amplification of the epidermal growth factor receptor (EGFR) gene. Less commonly, GBM arises in association with progressive genetic alterations after the diagnosis of a lower grade astrocytoma. These tumors are referred to as secondary GBM. The most widely described alterations are mutations of p53 and INK4a. 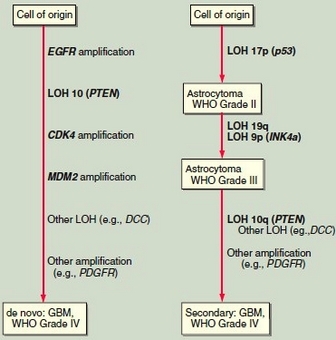 Other genes implicated in the development of these primary brain tumors include CDK4, MDM2, DDC, and PDGFR. LOH, loss of heterozygosity. Tumors with astrocytic cytologic features are the most common primary intracranial neoplasms (Fig. 12.1). The most widely used histologic grading system is the World Health Organization four-tiered grading system. Grade I is reserved for special histologic variants of astrocytoma that occur mainly in childhood and can have an excellent prognosis after surgical excision. These include juvenile pilocytic astrocytoma, subependymal giant cell astrocytoma (which most often occurs in patients with tuberous sclerosis), and pleiomorphic xanthoastrocytoma. At the other extreme is grade IV GBM, a clinically aggressive tumor. Astrocytoma (grade II) and anaplastic astrocytoma (grade III) are intermediate in their histologic and clinical manifestations. The histologic features associated with higher grade are hypercellularity, nuclear and cytoplasmic atypia, endothelial proliferation, mitotic activity, and necrosis. Endothelial proliferation and necrosis are strong predictors of aggressive behavior. Quantitative measures of mitotic activity also correlate with prognosis. The proliferation index can be determined by immunohistochemical staining with antibodies to the proliferating cell nuclear antigen (PCNA) or with a monoclonal antibody termed Ki-67, which recognizes a histone protein expressed in proliferating but not quiescent cells. The prognosis of brain tumor patients is closely associated with the histologic grade of the tumor. In a representative Finnish population, the median survival was 93.5 months for patients with grade I or II astrocytomas, 12.4 months for patients with grade III (anaplastic astrocytoma), and 5.1 months for patients with grade IV (GBM) tumors. Although these survival rates are somewhat lower than are generally reported, they represent a population-based experience and are not influenced by selection bias. Clinical features correlating with poor prognosis include age >65 and a poor functional status, as defined by the Karnofsky performance scale. Low-grade astrocytomas are more common in children than adults. Pilocytic astrocytoma, named for its characteristic spindle-shaped cells, is the most common childhood brain tumor and is typically benign. It frequently occurs in the cerebellum and is well demarcated from adjacent brain. Complete surgical excision usually produces longterm, disease-free survival. The median overall survival of grade II astrocytoma is 5-6 years. The optimum timing of surgery and radiation therapy for these patients is unknown. Since astrocytomas infiltrate surrounding brain, total surgical excision is impossible. Moreover, they are genetically unstable and accumulate mutations over time, leading to more aggressive behavior. For patients who are symptomatic from mass effect or poorly controlled epilepsy, surgical excision can relieve symptoms. For patients who are asymptomatic or minimally symptomatic at presentation, a diagnostic biopsy should be performed and, when surgically feasible, the tumor may be resected. Whether radiation therapy is administered immediately postoperatively or at the time of tumor progression is not thought to affect overall survival, but immediate radiation therapy does delay tumor progression. No role for chemotherapy in the management of low-grade astrocytoma has been defined. The large majority of astrocytomas arising in adults are high grade, supratentorial, and do not have a clearly defined margin between normal and malignant tissue. Neoplastic cells migrate away from the main tumor mass and infiltrate adjacent brain, often tracking along white matter pathways. Imaging studies do not indicate the full extent of the tumor. These tumors are almost all eventually fatal. Median survival of patients with grade III astrocytoma is <3 years and for those with a grade IV tumor, <1 year. Longer survival correlates with younger age, better performance status, and greater extent of surgical resection. Late in their course, astrocytomas, especially those located in the posterior fossa, can metastasize along CSF pathways to the spine. 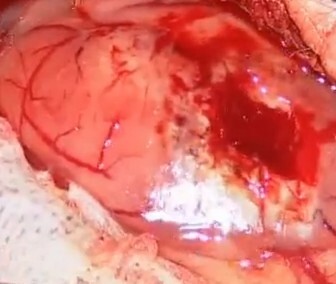 Metastases outside the CNS are rare. High-grade astrocytomas are managed with glucocorticoids, surgery, radiation therapy, and chemotherapy. Dexamethasone is generally administered at the time of diagnosis and continued for the duration of radiation therapy. After completion of radiation therapy, dexamethasone is tapered to the lowest possible dose. Because astrocytomas infiltrate adjacent normal brain, total surgical excision is not possible. Nevertheless, retrospective studies indicate that the extent of tumor resection correlates with survival in younger patients. Therefore, accessible astrocytomas are generally resected aggressively. Surgery is indicated to obtain tissue for pathologic diagnosis and to control mass effect. Postoperative radiation therapy prolongs survival and improves quality of life. Treated with dexamethasone alone following surgery, the mean survival of patients <65 years with glioblastoma is 7-9 months. Survival is prolonged to 11-13 months with radiation therapy. For primary glial tumors, radiation is generally administered to the tumor mass, as defined by contrast enhancement on a CT or MRI scan, plus a 2-cm margin. A total dose of 5000-7000 cGy is administered in 25-35 equal fractions, 5 days per week. The roles of stereotaxic radiosurgery and interstitial brachytherapy in glioma treatment are uncertain. Stereotaxic radiosurgery is the administration of a focused high dose of radiation to a precisely defined volume of tissue in a single treatment. Stereotaxic radiosurgery can potentially achieve tumor ablation within the treated volume. A major limitation of stereotaxic radiosurgery is that it can be used for only relatively small tumors, generally <4 cm in maximum diameter. 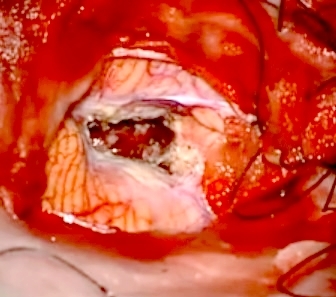 Interstitial brachytherapy, the implantation of radioactive material into the tumor mass, is generally reserved for tumor recurrence because of its associated toxicity, necrosis of adjacent brain tissue. Chemotherapy is marginally effective and is often used as an adjuvant therapy following surgery and radiation therapy. Temozolomide, an orally administered alkylating agent, has replaced nitrosureas, including carmustine (BCNU) and lomustine (CCNU), as the most widely used chemotherapeutic agent for high-grade gliomas. Temozolomide is generally better tolerated than nitrosoureas, notably producing less fatigue and pulmonary toxicity, and has the advantage of oral administration. Moreover, a randomized trial of radiation therapy plus temozolomide for the adjuvant treatment of GBM compared to radiation therapy alone was the first clinical trial to demonstrate a clear-cut advantage of adjuvant chemotherapy for that disease. The patients who received radiation therapy plus temozolomide had a median survival 21/2 months longer than those who received radiation therapy alone. The modest survival benefit appears to be restricted to a subgroup of patients with methylation and silencing of the promoter for the MGMT gene coding for O6-methylguanine- DNA methyltransferase. An alternative approach to the chemotherapy of high-grade gliomas that has shown survival benefit in controlled trials is the surgical implantation directly into the tumor resection cavity of polymer wafers that release BCNU locally into surrounding brain. The efficacy of this approach is similar to but probably slightly less than that of temozolomide, although without the attendant systemic toxicity of chemotherapy. Experimental approaches to brain tumor chemotherapy include efforts to bypass the blood-brain barrier using local injection of chemotherapeutic agents into the tumor mass or the intraarterial injection of chemotherapy following osmotic disruption of the blood-brain barrier. Molecularly targeted therapies are also being tested in patients with GBM. In particular, since mutation or overexpression of EGFR is common in GBM, EGFR antagonists or inhibitors of its signaling pathways are being evaluated in patients with GBM in clinical trials. Gliomatosis cerebri is a rare form of astrocytoma in which there is diffuse infiltration of the brain by malignant astrocytes without a focal enhancing mass. It generally presents as a multifocal CNS syndrome or a more generalized disorder including dementia, personality change, or seizures. Neuroimaging studies are often nonspecific, and biopsy is required to establish the diagnosis. Gliomatosis cerebri is treated with whole-brain radiation therapy or temozolomide; in selected patients, radiation to the entire neuroaxis is employed. • Incidence of primary brain tumors is 6/100,000 persons. • Approximately 18,000 primary brain tumors are diagnosed each year in the United States. • In adults, glioblastoma is the most common brain tumor, followed by meningioma and astrocytoma. In children, astrocytomas are second only to medulloblastoma. • Astrocytomas can be found at all ages, with an early peak between 0 to 4 years of age followed by a trough between the ages of 15 to 24 and then a steady rise in incidence occurs. • Peak age incidence of low-grade astrocytoma is 34 yr.
• Peak age incidence of anaplastic astrocytoma is 41 yr.
• Peak age incidence of glioblastoma is 53 yr.
• The specific etiology of astrocytoma is unknown. • Genetic abnormalities leading to defective tumor-suppressing genes or activation of protooncogenes has been proposed. A provisional diagnosis of astrocytoma is made on clinical grounds and radiographic imaging studies. Tissue pathology is needed to establish the diagnosis and to grade the astrocytoma. • Two common grading systems used for astrocytomas are the World Health Organization (WHO) and the Saint Anne-Mayo grading system. 1. Grade I juvenile pilocytic astrocytoma, subependymal giant cell astrocytoma, and peliomorphic xanthroastrocytoma. • The Saint Anne-Mayo system grades astrocytomas according to the presence or absence of four histologic features: nuclear atypia, mitoses, endothelial proliferation, and necrosis. 1. Grade I tumors have none of the features. 2. Grade II tumors have one feature. 3. Grade III tumors have two features. 4. Grade IV tumors have three or more features. • Grades I and II astrocytomas are commonly called low-grade astrocytomas. • Grades III and IV astrocytomas are called high-grade malignant astrocytomas. The differential diagnosis is vast and includes any cause of headache, seizures, change in mental status, and focal neurologic deficits. A CT scan or MRI of the head essentially makes the diagnosis of an intracranial brain tumor. However, tissue is needed to establish a diagnosis of astrocytoma. Blood tests are not very specific in the diagnosis of astrocytoma. MRI is the diagnostic imaging study of choice. MRI and MRA are used to locate the margins of the tumor, distinguish vascular masses from tumors, detect low-grade astrocytomas not seen by CT scan, and provide clear views of the posterior fossa. • Before surgery, dexamethasone 10 mg IV is given followed by 4 to 6 mg IV q6h. • Phenytoin 300 mg qd is used for seizure control. • Radiation therapy is used postoperatively in patients with low-grade astrocytoma (controversial) and in high-grade astrocytoma. Some authorities recommend waiting for symptoms to occur following surgery in patients with low-grade astrocytoma before using XRT. • Chemotherapy has not been recommended in low-grade astrocytoma. • Chemotherapeutic drugs carmustine and lomustine have been used with some effect in patients with high-grade astrocytoma. • High-dose chemotherapy followed by autologous bone marrow transplantation is a consideration. • Approximately 10% to 35% of astrocytomas (usually grade I pilocytic astrocytomas) are amenable to complete surgical excision and cure. • The management of low-grade astrocytomas depends in part on the location of the tumor. • In low-grade astrocytomas, the tumor is more infiltrative and therefore not amenable to complete excision. Nevertheless, most studies recommend surgery to remove as much of the tumor burden as possible. • The prognosis of patients with low-grade astrocytoma is highly variable. A median of 7 yr is cited. • Malignant astrocytomas, grades III and IV, usually require surgery for debulking. It is not known from prospective studies if surgery improves survival; however, retrospective studies suggest a survival benefit in the surgical treated group. • Median survival for patients with high-grade astrocytomas is 2 yr for anaplastic type and 1 yr for glioblastoma multiforme.